(And Overall Rating) Thumbs Up! Mfg. Weight 3 lb, 9 oz. Being a true gadget guy, I actually own three tents. One is a 15 year old free-standing four season dome tent that I have used since I was a kid. It was bought at a large sporting-goods store by my dad before we knew anything about this stuff, but has served me well ever since from the desert to the snow covered hills. The main drawback to this tent is that it is heavy as hell  almost nine pounds with the complete rainfly and all of the associated hardware. This is fine if you are travelling with a partner or small group, since it sleeps three people, but it is certainly not a solo backpacking tent. My next tent was a two person, three season, lightweight, non free-standing hoop tent. This is the tent that I carried for hundreds of miles through Wyoming. It is made by Eureka!, but I do not remember the name of the model and I am sure that they have discontinued it. It was a two hoop tent very similar to the Sierra Designs "Clip Flashlight." I remember buying it because of its ridiculously low weight for a tent with a full rainfly and a small vestibule. I think the whole package weighs in at 4 to 4.5 lbs. This was a great tent (actually it still is), but one day, near the top of one of the White Mountain Peaks (still well within the treeline), I came to a site where there wasn't a whole lot of soil to stake the tent out with. I had to use cord I carry and some creative knots to tie it to trees and rocks to get it rigid enough to withstand the rain and wind that night. And that's when I realized the major drawback of a non-freestanding tent. It's non freestanding. Well ventilated for summer use. Enough room for 1 person and some gear (why get another 2 person tent  I wanted something small for solo trips and for my own shelter when with a group). Easy to pack and set up. Price (to make them weatherproof they are made from exotic materials like Gore-Tex and other expensive waterproof/breathable fabrics). Size (I am a hot summer sleeper and bivy sacks do not have room for air to flow. Especially on hot, sticky, rainy summer nights). Room (no room to keep gear like boots and stoves out of the rain). This meant that I was limited to the few single person (or small two person) free-standing designs I could find. In the end I settled on the Zephyr by Eureka!. It met all of the criteria I had outlined, and cost me under $120. With a few bucks more for a gear loft, I created a primo shelter for myself that I absolutely love. Besides, it was the only one person freestanding tent that I could find, all the others were 2 person tents, primarily dome shaped, and much heavier. Eureka! tents have a reputation for not being "top quality". And I'll admit, they're not North Face or Bibler single wall mountaineering tents made to withstand 100+ mph winds and three foot snow loads. But I'm not summiting Everest, and neither are you. I'm hiking in 30 degree + weather in the shelter of a forest. The heaviest snowload I ever had fall on me was three inches, and that melted in a matter of hours. The worst winds were probably 30 mph, and I was in the trees, so the tent wasn't exposed to the full brunt of the wind either. My biggest problem is not surviving a sudden arctic blizzard for three days on the side of Mt. Rainier, it's getting away from the damn blackflies long enough to eat dinner, and to stay out of the light to moderate rain for a few hours. In these types of conditions Eureka! tents excel, and I didn't have to sell my car to afford one either. The Zephyr is a freestanding, single person, rectangular shelter. For a tent in this price range, Eureka! has really packed some outstanding features into this tent. It has a wrap-around floor (the seams are up four inches off the ground so water doesn't seep in), ample ventilation at the apex of the tent, and door panels with snag-free zippers that close up tightly but can be rolled up to provide extra ventilation. There is room for a gear loft, and the frame is supported by aluminum poles, so it can take the weight. The geometry of the tent is a bit odd. The Zephyr does not have a full coverage rainfly, but rather a semi-rectangular fly that extends over the door panel to provide an overhang. When I first bought the tent, I wasn't sure how well this would actually work. I was hoping for something with a real vestibule to keep my pack and boots and other gear out of the weather, but still outside of the tent. Although I haven't had to ride out more than a brief rainstorm in this tent, I am learning to live with the lack of a vestibule. In the end I think the smaller rainfly is a fair trade for the lighter weight. The tent provides enough interior room for a real size human to sit up (very helpful when changing clothes) and plenty of pockets to keep small gear handy. The door is an interesting design: it opens wide to allow easy access, yet is asymmetrical so it folds out of the way. This allows one to recline in the doorway and lean back inside the tent, while keeping your feet and the dirt outside. This has become a favorite way to cook dinner when the elements are less than perfect. The tent seems to be well built  the seams are all double or triple stitched, the poles are sturdy aircraft grade aluminum, and the materials are all coated and sturdily woven. There are some nice touches, like snag free pole ends, sturdy loops to stake the tent out, and simple Velcro and buckle attachments for the rainfly so you can actually tension it properly, even after it becomes wet. There are also loops on the outside of the rainfly so you can tie it out if the winds begin blowing or the snow piles up extra heavy. As with most tents in this price range, though, it pays to set it up and spend a few hours with the seam sealer before going out into the rain. The tent sets up in a matter of minutes, and can be very easily done by one person. Basically, the two poles form an X from the 4 corners of the rectangle. The poles cross at the apex of the tent, and pass through sleeves at that point (hence the snag-free pole ends). Once in the sleeves, they are anchored to the corner tabs of the tent, and the whole thing supports itself. The sidewalls of the tent are suspended form the poles with clips, and the apex has a loop and "button" setup that holds it together at the junction of the poles. The rainfly has one cross pole that forms the awning over the door and it attaches to the main poles by a series of velcro strips. The four corners can then be buckled into place with fastex buckles and the whole fly tensioned. As I mentioned above, there are also extra points on the rainfly that you can tie cord to if you wish to stake out the fly for extra strength. Ventilation is critical to keeping dry inside of a tent. The High/Low Ventilation system (patent pending) used on many Eureka! tents provides superior air flow in all types of weather. The air you exhale is moisture-laden and is the source of most of the condensation in a poorly ventilated tent. The window covers on High/Low doors can be opened from the top and/or the bottom, to allow cool dry air to enter, and warm, moist air to escape. 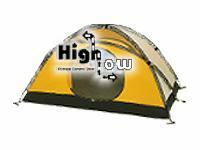 High/Low doors are placed to the side of the tent, rather than in the center, so that they are closer to your head when you are sleeping. So, if you are looking for an inexpensive, reliable, single person shelter, I heartily recommend the Zephyr or the Zephyr XT. Please note that anything I say here is simply my opinion. I am an expert (and a legend) only in my own mind. For the official corporate scoop, check out this product atEureka! 's Website.You can click here or on the banner below.